DOES NOT FIT TWIN BEDS; Made to fit toddler bed / crib mattress size 28 x 52 inches. Disney's Mickey Mouse "Captain Mickey" Take flight with Mickey and his friends in this brightly colored toddler set. Bold and bright shades of blue, orange, yellow and red. 4 Piece set includes Comforter, Top Sheet, Fitted Sheet and double printed Pillow Case. Dimensions: 9 in. W x 11.25 in. H x 5.5 in. L Includes: Comforter, top sheet, fitted sheet and double printed pillow case Material: Polyester. 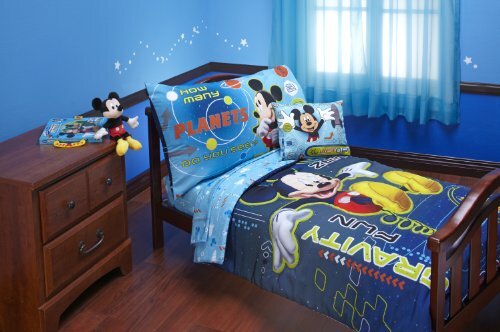 Come inside, it's fun inside the Disney Mickey Mouse Playhouse 4-Piece Toddler Bedding Set! This toddler-sized set includes a quilted comforter, fitted bottom sheet, flat top sheet, and standard size pillowcase. The quilted comforter features everyone's favorite mouse, Mickey, and his pal Pluto dancing down the street with the Mickey Mouse Club House in the distance. 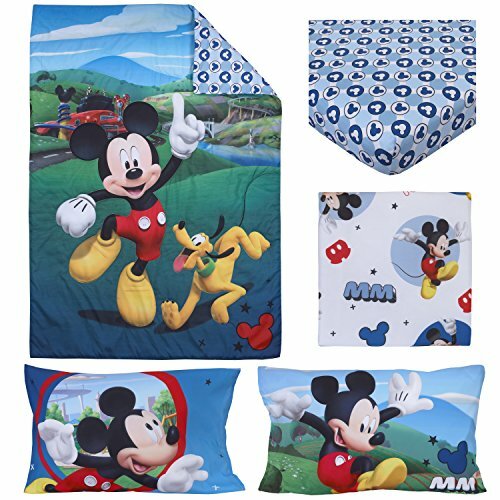 Turn the comforter back to reveal a fitted sheet with a popping blue-on-blue pattern of Mickey's iconic silhouetted head and a crisp, white flat sheet featuring Mickey in a variety of poses against a pattern of "MM" initials, silhouetted gloves, Mickey heads, and more, in shades of dark blue, light blue, bright red, and white . A double-sided pillow case features Mickey popping from a red circle and blue background on one side and Mickey dancing through the green hillside on the other. 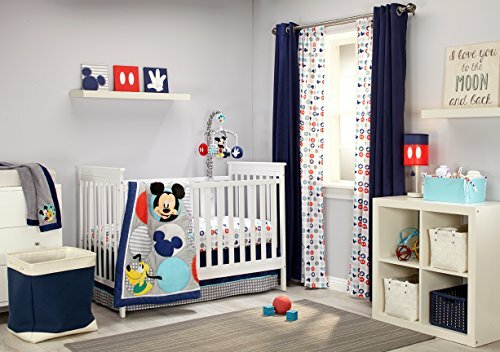 All pieces of the Disney Mickey Mouse Playhouse 4-Piece Toddler Bedding Set are designed to fit a standard size toddler/crib mattress (28" x 52") and all fabric is made of 100% super-soft Polyester Microfiber. Mickey's Best Buddies - 4pc Crib Set includes: comforter, dust ruffle, sheet, and nursery organizer. Add a touch of elegance, Mickey-style, with this sophisticated, geometric set. 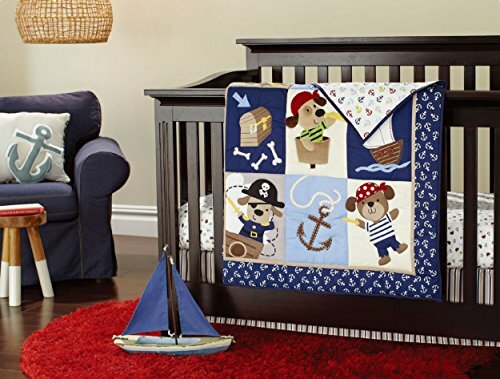 Includes grey comforter with pops of Goofy, Mickey, and his iconic star, hand, button, and silhouette with top stitching and navy border; coordinating fitted sheet; dust ruffle with blocks of navy, light blue, and grey; and matching nursery organizer. Coordinates with a full line of Mickey's Best Buddies nursery decor and accessories. 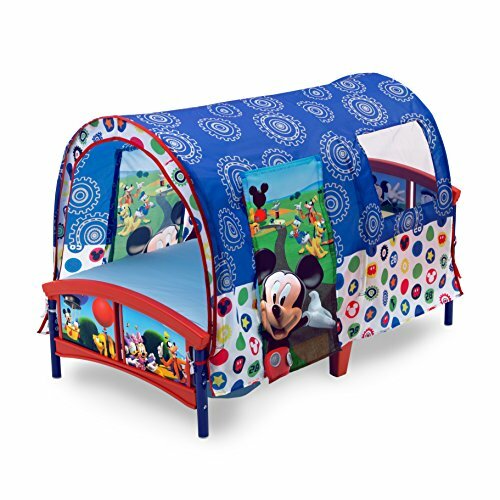 Create a magical clubhouse for your mini Mouseketeer with the Disney Mickey Mouse Toddler Tent Bed by Delta Children. It evokes the spirit and appeal of everyone's favorite mouse, Mickey. The tent sits above a sturdy toddler bed, with a mesh window and a roll up door on either side. 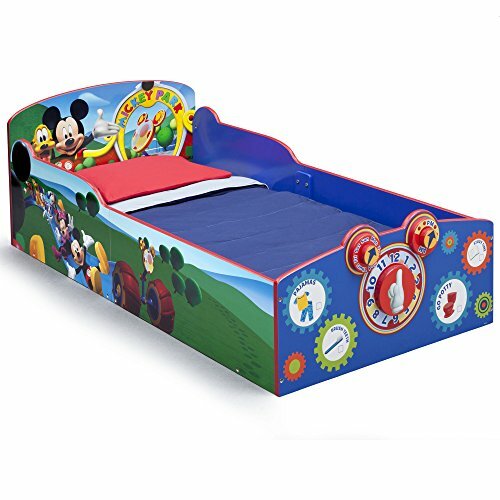 Make his bedroom magical with this Mickey Mouse Plastic Toddler Bed from Delta Children! 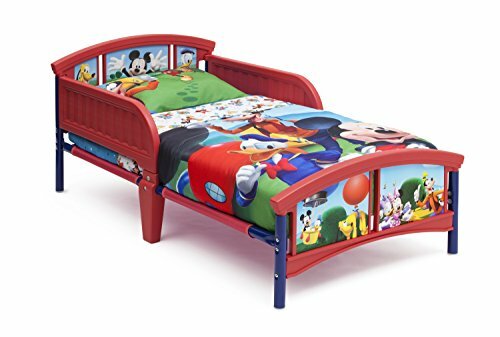 Featuring adorable graphics of Mickey and friends, this sturdy bed is outfitted with two side rails, so you can rest easy knowing your boy will be safe and secure while he sleeps. What will your little one love most about this Mickey Interactive Wood Toddler Bed from Delta Children? Will it be the colorful Disney graphics that inspire any mini mouseketeer? Or will it be the before bed checklist and movable clock at the footboard? Actually, we think they'll love it all! And parents will love the sturdy wood construction with elevated sides and low to the ground design that helps create the big-kid room of their dreams. 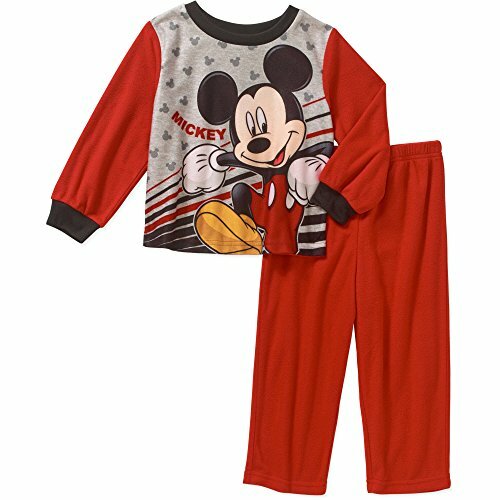 Mickey Mouse is the main attraction on this two-piece pajama set for your boy, Your little one will love the bright graphics and flannel comfort of this baby toddler boys' 2-piece pajama set. Both a long-sleeve top and a matching pair of pants are included in the set, and both will keep him warm and cozy. The top has a stylish graphic on the front of Mickey Mouse, while the pants have a hassle-free covered elastic waistband for a secure fit. These officially licensed pajamas are great for sleeping and lounging around the house. 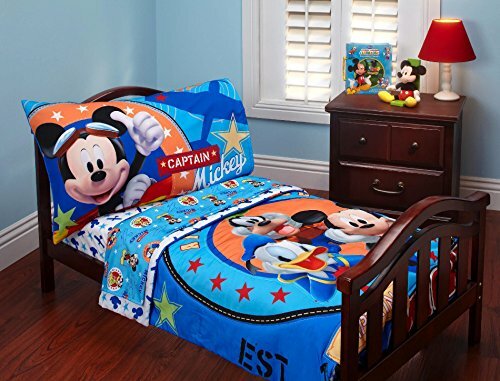 Disney's Mickey Mouse "Captain Mickey" Take flight with Mickey and his friends in this brightly colored toddler set. Bold and bright shades of blue, orange, yellow and red. 4 Piece set includes Comforter, Top Sheet, Fitted Sheet and double printed Pillow Case. Dimensions: 9 in. W x 11.25 in. H x 5.5 in. L Includes: Comforter, top sheet, fitted sheet and double printed pillow case. This Set Fits all Toddler Beds and Cribs (Single or Convertible) . The quilt measures 33" x 42", The 4 pcs bumper is 9.5" high, the long sides of the bumper are 52", short sides are 27.95" long. Crib skirt fits 28 x 52 inches mattress. Sheet is 100% cotton, fabric content is exclusive of decoration. Filling is 100% polyester. Battery： no battery used. Comforter with lovely picture could also used as tummy mat when baby play on the floor for tummy time. Crib sheet is fully elasticized for a snug fit. See how to setup the Disney Baby Mickey Mouse Sweet Wonder Play Yard and Crib -- quickly and easily. 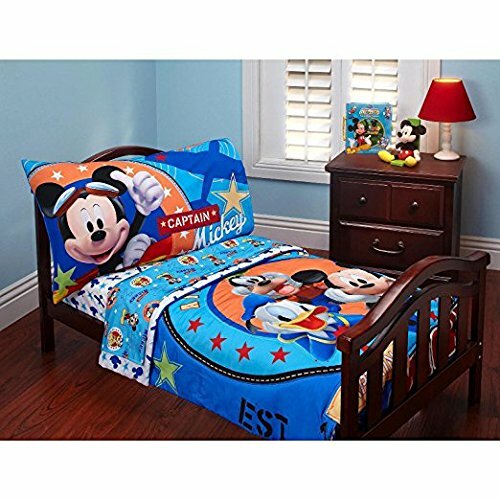 Compare prices on Mickey Baby Bed Set at ShoppinGent.com – use promo codes and coupons for best offers and deals. Start smart buying with ShoppinGent.com right now and choose your golden price on every purchase.